Uncategorized | St. Brendan's N.S. We went on our school tour last Friday. We went to WIT Arena. We travelled by bus and I was sitting beside Dessie. When we got there we met our Instructors,Tom,Jack and Conor. First we played soccer and the other team won by one goal. After soccer we went on the bouncy castle,we were racing each other. I won against Nadine. I really liked the Go-Karts the best. On the way home we went to McDonalds,I had chicken nuggets, chips,coke and a McFlurry ice cream. I was very tired when I got home but I had a great day. The school tour was on Friday. We went to Waterford IT. The people who were looking after us were named Tom,Conor and Jack. We did a lot of activities like KMX Kart,Inflatable Fun and Human Table Football . I Liked the KMX Karts the best because they are fast. I went around the track track 7 times and my legs were sore. We had a game of football and my team won. It was a very sunny day,we had to go indoors a lot to do activities. We had races on the bouncy castles,I raced against Chris and it was a draw. Mr Duggan and Jackie raced each other and Mr Duggan won. On the way home we went to McDonalds and I got a burger,chips,coke and McFlurry ice cream and a Milk Shake. I enjoyed the day. On March 12th and 13th a couple Dennis and Olivia came to St Brendan’s N.S. 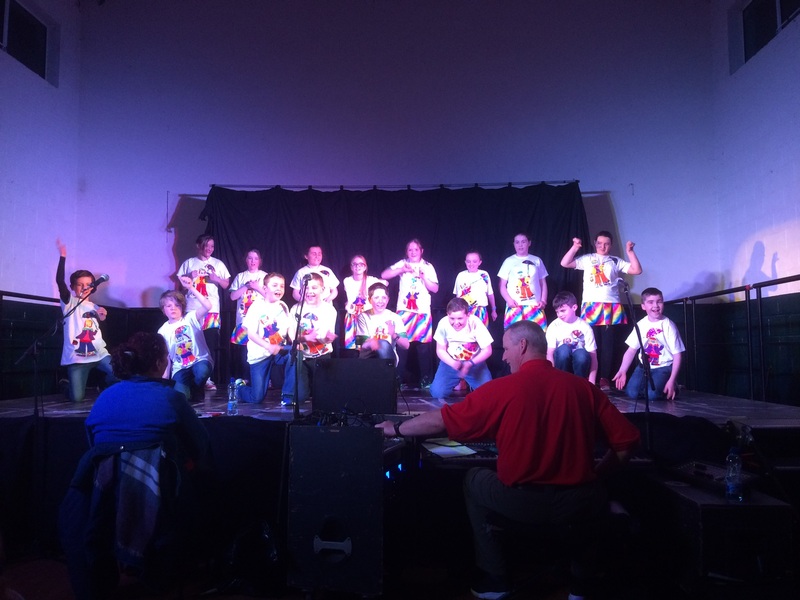 Schools all over Kilkenny Carlow and Wexford and some in Waterford take part in the funky kids programme. The last time Dennis and Olivia came to St Brendan’s was in 2016. Dennis and Olivia pick songs and make up dance moves and then teach the children the moves and the words of the song over 10 weeks and then after those 10 weeks Dennis and Olivia set up at Hugginstown hall and put on a show with the moves we learned. The parents come and watch the show this is called the Funky Kids show. The children also make their costumes out of different materials. A raffle is also organised on the night. This year two children each night did a comedy scene. And let me tell you something it blew the crowd away. Silver? It should be Gold! Silver Lining productions came to Newmarket school on the 19-12-17. The children here in Newmarket loved them and I`m here to tell you why. Kate and Danny were the two entertainers. They were absolutely brilliant. Kate is very talented, in the show Kate did dances and she did a bit of comedy. Danny was great as well. He did things like play the drums and the clarinet. They did a lot more than that but we would be here all day if I named them all. One thing that really added to the show was the laser lights and music. One act I really liked was when Kate put glasses in between platforms and put a metal cylinder on top. Then she put a piece of wood on top and then balanced. I loved the show and I definitely recommend it. Thank you for reading. Paddy Rohan (Mikey’s grandad) came to Newmarket N.S. on 06/09/2017. He told us about what school was like when he was young. He started school in1949. His first headmaster was Mr. O’ Sullivan . Sometimes he would come to school by pony with his brother Noel. Before he came to school he would milk the cows and then bring the milk to the creamery .And sometimes he would milk Mr. Twomey’s cows too. When his younger brother ,Seamus, started school they had to get a pony and trap . In school they had no electricity or heating so they used tilly lamps for light and a fire for heat. Everyone had to bring in a block of wood the fire and whoever brought in the in the most wood each week would get no homework for the weekend. Each day they would drop the pony and trap into Mrs. Nolan,who lived beside the school . The toilet in school didn’t flush and were only cleaned once a month . There was no toilet paper so you would need to bring newspaper instead . Also there was no sink only a barrel filled with rainwater. For drinking water they had to bring two buckets of water from St. Brendan’s well to the school . His talk was very interesting and it was great to hear about what our school was like in the 1950’s.